Next dish: Tropical fruit compote: Mango, Papaya, Plantain, Apple. About two quarts. Cooked down to half their volume by late morning. Next dish: Roasted chicken: Organic Breasts and Drumsticks from Sprouts: Salt, garlic, black pepper, red pepper, paprika rub. Falling off the bone tender by lunchtime. Next dish: Stuffed Portobello Mushrooms. (These went on after the Frittata was out of the cooker). About one hour to baked perfection - very tender and very tasty. Next dish: Bread pudding. This was easy. The bakery at Sprouts was just putting the mix into pans and agreed to sell me some uncooked. The mix came out of my refrigerator at 40 degrees - so it was colder than normal - and cooked in about 45 minutes. I also tried frozen dinner rolls because I like the smell of bread baking. I was disappointed that they did not brown and will try a different brand next time. My cooking appliances were 4 All Season Solar Cookers. By 11 am two of the cookers had been set aside and only the chicken and compote were still on. Lunch (chicken and tropical fruit with syrups, sourdough rolls, bread pudding) was great! 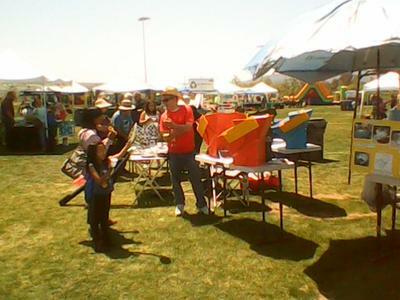 Lots of passersby and lots of education about solar cooking. 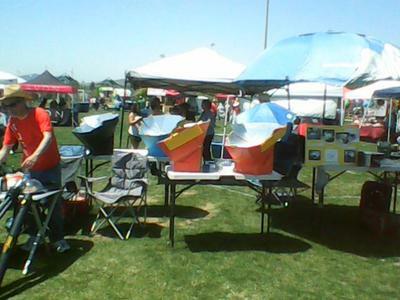 Thank you for sharing this great solar cooking expose'. That was quite an ambitious menu you had and it sounds like it was a real hit with the passersby and observers. Nothing like actually seeing things cook in a solar oven to make believers out of the newcomer. The photos look great. Colorful Cookers!